The torch has officially been passed in the AFC South. The reign of Peyton Manning and the Indianapolis Colts has come to an end, and the division now belongs to Matt Schaub and the Houston Texans. While the Texans’ era of dominance in the division won’t last nearly as long as the Manning-led Colts, for the time being the AFC South is one of the only divisions in the NFL in which the identity of the first-place team seems to be set in stone. Houston’s window of opportunity is open now, and while they have their sights set on larger goals, the Titans, Jaguars, and Colts each will try to develop their young first-round talent quarterbacks in hopes of unseating the Texans in 2013. Indianapolis is currently one of the major rebuilding projects in the league. The Colts gutted most of their roster from a year ago, as they prepare to transition into the Andrew Luck era. Luck still has Reggie Wayne to throw to, but that’s the only proven offensive weapon he’ll have to work with. Though his other targets don’t have the pedigree of Wayne, there is some reason for optimism about the rest of the receiving corp. Former Ram Donnie Avery has shown flashes in his career, and gets another chance to prove himself. Second-round pick Coby Fleener is expected to challenge right away for the tight end position. Running back remains a major question mark. The Colts didn’t make a strong attempt to upgrade the position, so it will be another year of disappointing first-round pick Donald Brown and last year’s fourth-round pick Delone Carter. Defensively, Dwight Freeney, Robert Mathis, and Antoine Bethea are still there and will provide veteran leadership, but most of the other eight players around them are mediocre at best. Unless of course, anyone believes that former Eagle Moise Fokou is going flourish with his new team. It’s going to be another rough year for the Colts. This is clearly a rebuilding year, as Indianapolis tries to groom a very young team and their new franchise quarterback for success in the future. The Jaguars are trying to put Blaine Gabbert in a much better position to succeed this season. They spent their top draft pick on highly coveted wideout Justin Blackmon, and signed former Dallas Cowboy Laurent Robinson. Maurice Jones-Drew remains one of the top running backs in the game, having won the league’s rushing title in 2011. He’s currently a holdout, but there’s little reason to believe he won’t be dominate again when he returns to the field. Defensively the Jags are anchored by a pair of tackling machines, Paul Posluszny and Daryl Smith, who combined for 258 tackles last year. They hope to get a boost in their secondary with the healthy returns of starters Rashean Mathis and Derek Cox. On the defensive line, they need young lineman Tyson Alualu and Jeremy Mincey to step up. If Gabbert can take a big step forward, the Jaguars have a chance to be a much better team that could surprise some people. All of the pieces are in place for this team to have a very good offense, but its a matter of whether or not the man under center can put it all together. This team still has some big holes to fill, but they have a 7-9 ceiling. The Titans are floating around in NFL purgatory. They aren’t good enough to make the playoffs, but they aren’t an awful team either. The best thing this team can do in 2012 is find out whether or not quarterback Jake Locker can play. The second-year man spent most of his rookie season watching and learning from veteran Matt Hasselbeck. The supporting cast is in place for Locker. Chris Johnson had a horrid season by his standards a year ago, but the team expects him to bounce back to his All-Pro form. Kenny Britt has more than his share of off-field issues, but he’s an electric playmaker that gives defenses all kinds of match-up problems. The defense will be this team’s big problem. They lost their best cornerback, Cortland Finnegan, and their unit now lacks a dominating personality. The secondary is now a weak point, and the team will look for a new leader to emerge. Kamerion Wimbley was the team’s big free-agent acquisition, and the Titans hope he’ll provide a boost to a defensive line that is stocked with disappointing top draft picks from recent years, such as Derrick Morgan (first-round pick in 2010) and Sen’Derrick Marks (second-round pick in 2009). Tennessee is the clear-cut second best team in the division, but that isn’t saying much. They’re good enough that they’ll be a tough out for a number teams, but they won’t be a serious contender for even a Wild Card in the AFC. If you look at some of the players Texans lost this off-season, you’d think that they’d be preparing to take a significant step back in 2012. Gone are DeMeco Ryans and Mario Williams, two of the biggest names on their defense from recent years. Gone is sturdy right tackle Eric Winston, who had to be released for salary cap reasons. And yet in spite of these loses, the Texans are not only still the class of the AFC South, but are also still considered by some to have a legitimate chance to represent the AFC in the Super Bowl. While I myself wouldn’t go as far to say that this a legitimate Super Bowl contender, I do believe that this is a heck of a football team, at least when healthy. The Achilles heel of this team is that several of their most important players are injury-prone, and can’t be counted on to play a full season. Matt Schaub played in just 10 games last season, and has only made it through a full 16 games in two out of his five years as the Houston starter. Star receiver Andre Johnson is now 31 years old, and battled a hamstring problem that limited him to just seven games in 2011. 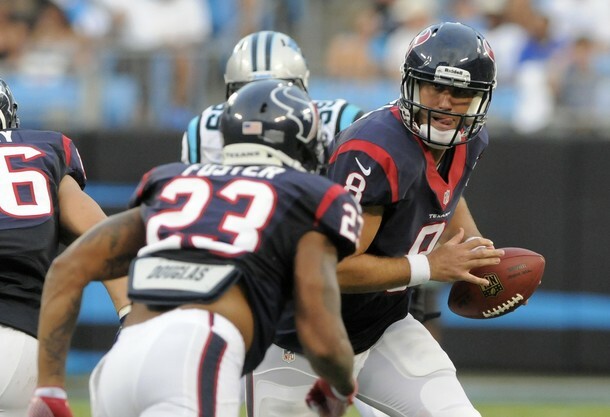 The Houston offense also features Arian Foster, who has developed into one of the premier running backs in the league. He ran for over 1,200 yards and 10 touchdowns in just 13 games during the regular season. His backup, Ben Tate, also nearly ran for 1,000 yards himself, giving the Texans a lethal combination at the position. The defense should still be excellent with Wade Phillips pulling the strings, and a talented core consisting of Brian Cushing, J.J. Watt, Connor Barwin, and Jonathan Joseph. A big reason that the Texans still finished 11-5 even with two of their big offensive stars sidelined is because the defense run by Phillips was absolutely superb. He may not be cut out to be a head coach, but make no mistake he is a master defensive coordinator, and doesn’t get enough credit for the success of this team. The best thing that happened to this team before the 2011 season was the decision to hire the former head coach of the Dallas Cowboys to run the defense. With T.J. Yates running the show at quarterback at the end of the season, the pressure was on Phillips and his defense to carry this team, and veteran coach put together one of the best coaching jobs of his career. As much as Phillips means to this team, they’ll only be able to make a deep playoff run if Schaub, Johnson, and Foster are all healthy at the end of the season. But they’ll have no trouble taking their second straight division title, and they won’t be a team that anyone wants to face in January. Is Mychal Kendricks Playing Out Of Position? #3) Colts (6-10) QB Luck settles into the Franchise QB and puts up some good #’s to help the Colts remain more competitve than people think, they have an easier schedule since they were a last place team last year and have some good pieces to the puizzle with a young and improving OL. The DL can still bring pressure on opposing QB’s the key will be can they stop the run and be physical at the point of attack as new Coach Chuck Pagano likes to preach and coach, it will take them a little bit to get these type of players into their program but I still think they surprise many folks and remain competitive in most of their games.. Luck appears to be the Real Deal from all acounts and reports and from what little I have seen so far and can actually move around in the pocket a litte quicker that people think..